Spiderman! Spiderman! Do whatever a punch can! Today’s card is a birthday card I made for my newphews 7th birthday. Punch art is one of my very favorite things to do. It takes time but the results are great and it helps justify purchasing the punches. Spiderman is made mostly from various ovals, the full heart and the word window & modern label punches. 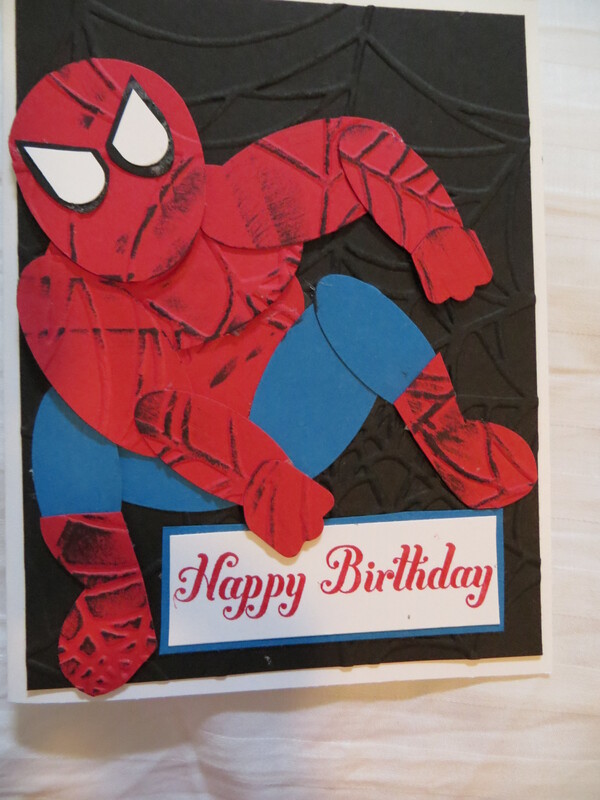 The fun part was putting all the “spidey” pieces in the Stampin Up Spider web folder (now retired) to make his outfit authentic. Washi Tape is all the rage and leave it to Stampin Up to keep up with the trends. They have several sets of Washi Tape in both the annual catalog and the holiday catalog. 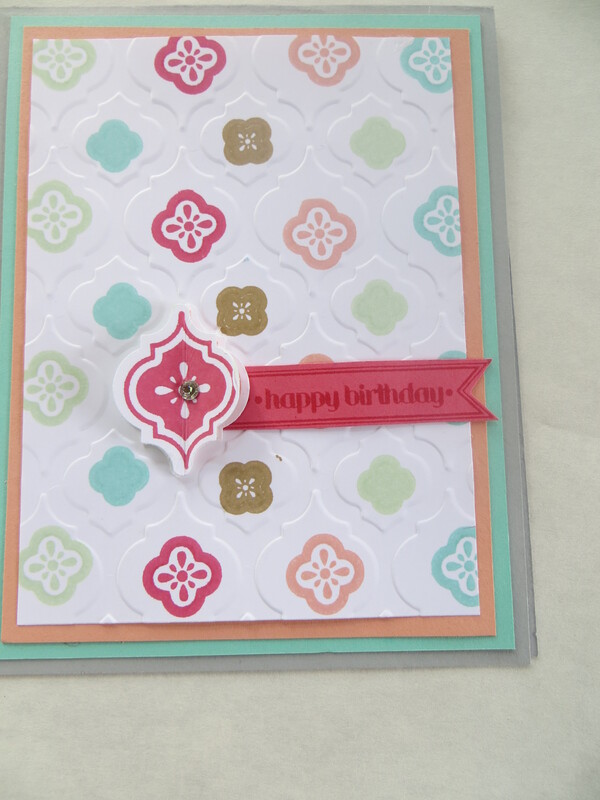 For this card, Cammie used the Off the Grid #130736 and mambo ink to add some character to the whisper white cardstock. She then started playing with the Gingham Garden #129314 and Epic Day #131269 washi tape and used various lengths to add texture to the card. She finished the card by adding the sentiment from the Label Love stampset #130622 and added 2 Artisan Labels punches #130920 with brads to anchor the sentiment. I know you are all probably getting sick of the Mosaic Madness stamp set from the Stampin Up annual catalog and all my posts but I can’t help it when I get new stuff I like to play with it until it gets old. But I promise after today I will be done with mosaic madness for now…. For today’s post I wanted to use a subtle approach to the mosaic madness set #130249 and both the coordinating mosaic embossing folder#129984 and mosaic punch #131267. If you love this set as much as me be sure to take advantage of the Mosaic bundling option when purchasing the punch and stamp set together you save 15%. Be sure to use the item # using the #132733 for clear stamps and #132734 for wood stamps to receive the discount. Just to get crazy I added another new product the Artisan Label punch #130920 to anchor the sentiment. To complete the look I added basic rhinestones. 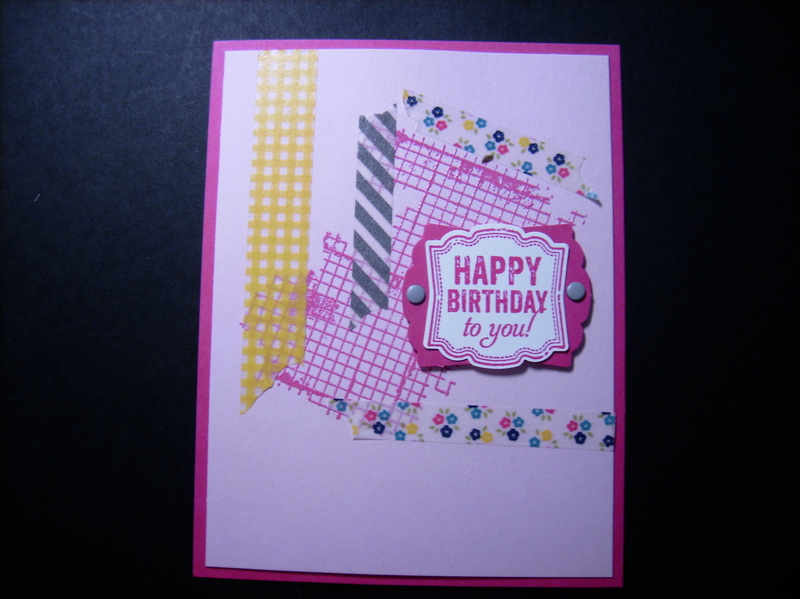 Today’s post is another card that I got inspiration from the Stampin Up annual catalog from page 121. I used the new 2013-2015 in colors and added the 3D embellishment made using the Mosaic Madness stampset #130249 and the coordinating mosaic punch #131267. To make the embellishment you need 3 images and then you fold them in half and attach them to one another. 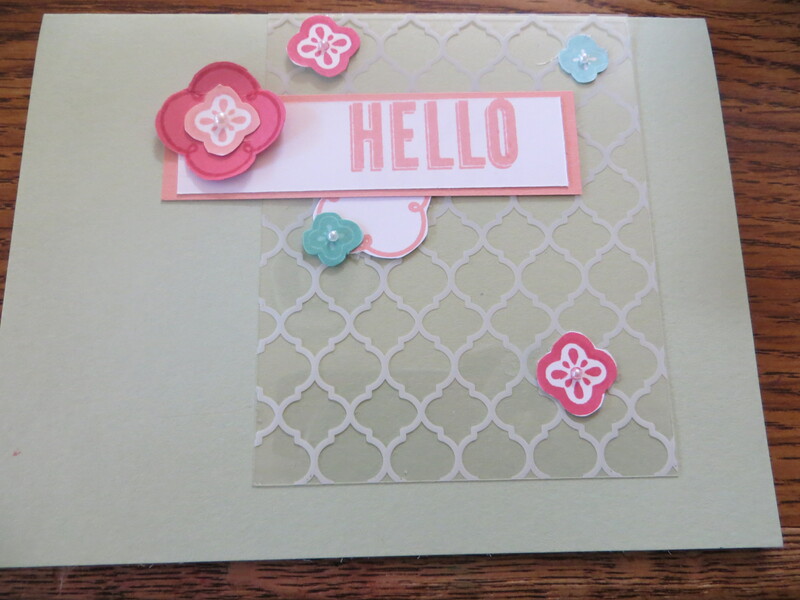 The background is the mosaic textured embossing folder #129984. The birthday banner was stamped using the Itty Bitty Banner #126257 and coordinating Itty Bitty Banner #129267 framelits. The mosaic madness suite of coordinating products makes card making a snap. You can also save 15% when bundling the stampset and punch together using the #132733 for clear stamps and #132734 for wood stamps. Colleges are getting back in session for fall and our lovely niece started her freshman year at Radford University this week. Nothing says college like herring bone background. 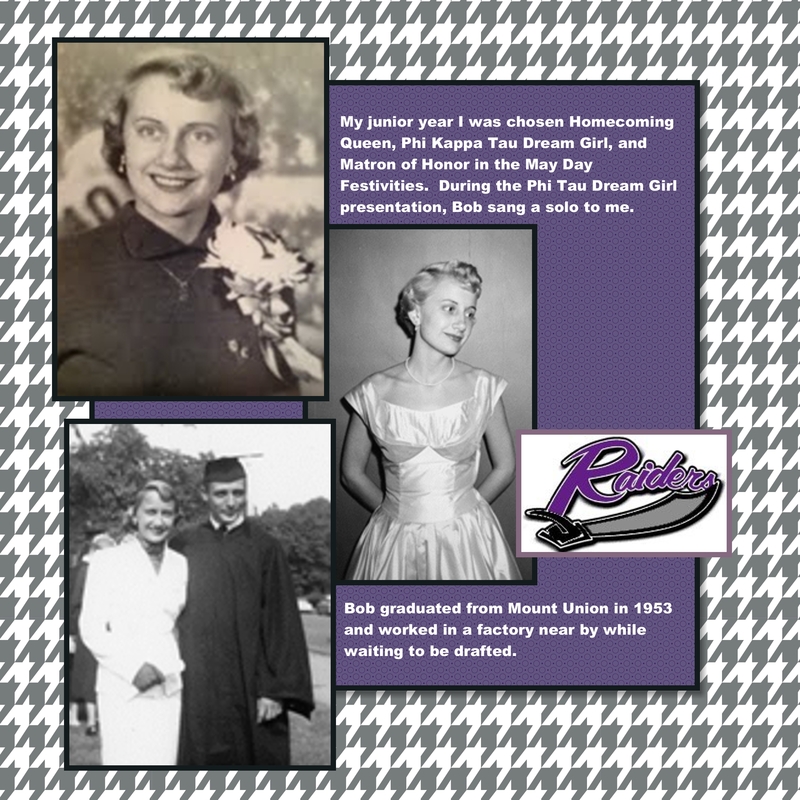 To pay tribute to all college kids old and new, today’s post is a digital scrapbook page from my mother in laws book of her life. It’s Tuesday so that marks another Digital Download day. 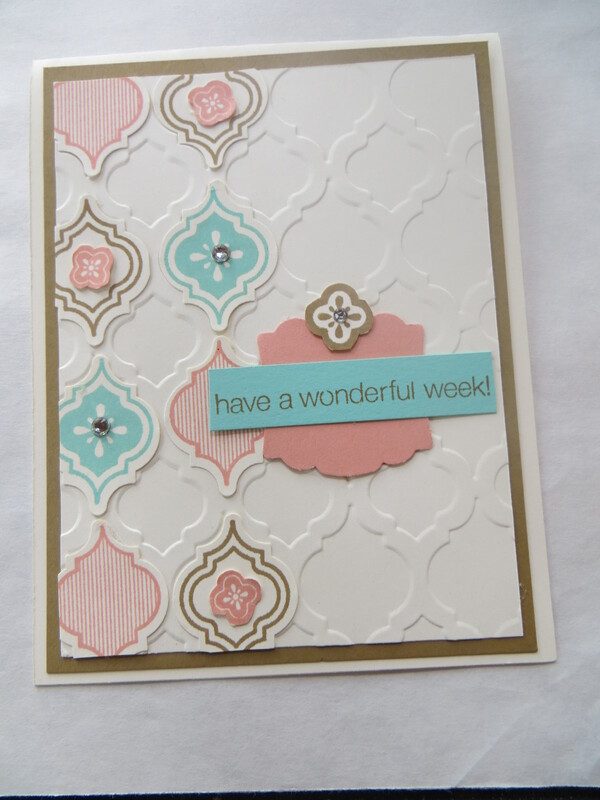 Be sure to check out the newest downloads for MDS available on the Stampin Up site. Whenever I am in a design slump, I just call in for the experts! I open my Stampin Up annual catalog to find something I can CASE (Copy and Steal Everything) or find something to inspire me. For today’s card, I turned to page 121 of the Stampin Up annual catalog and switched out the color pallet to using the new 2013-2015 In colors. It’s hard to tell from the picture, but this card has a strip of printed transparency from the Quatrefancy Speciality DSP #130141. I added random stamped and hand cut images from the Mosaic Madness stamp set #130249 to create this card. Thank you Stampin Up design team members for making such great samples and putting them in your annual catalogs to inspire us and help us overcome design block. As a tip, when working with transparencies, to secure the transparency to the card base I used glue dots and then added the elements on top of the transparency to hide the glue dot. It’s the 25th of the month so it is truly a banner day for a Christmas card. 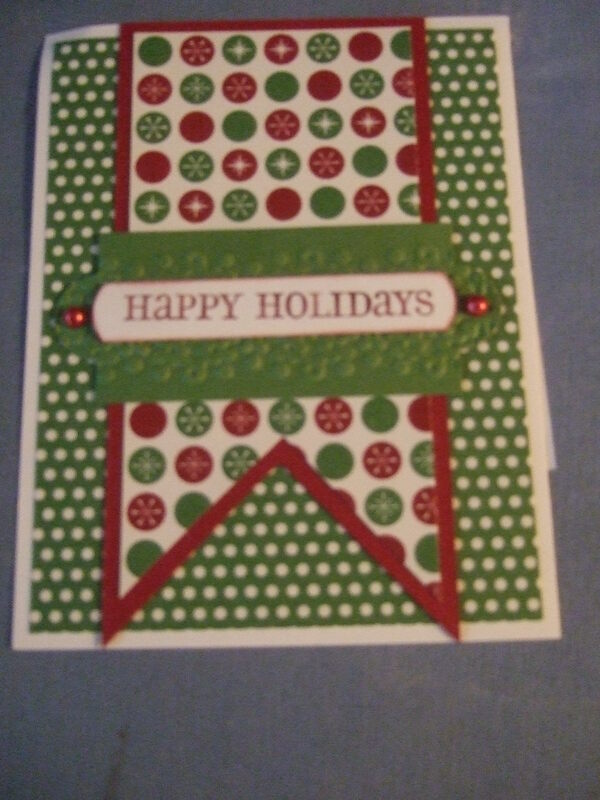 For this card, Cammie used last years Stampin Up Christmas Cheer (now retired) DSP to make this super quick and easy card. The banner was hand cut and matted in Cherry Cobbler cardstock. The focal piece is an elongated Apothecary Accents framelit #127003 and she created an elongated window using the Word Window punch #119857. This layout will work with any DSP and stampsets but why not get started on some easy Christmas cards using the new Christmas DSP in the Stampin Up Holiday catalog?